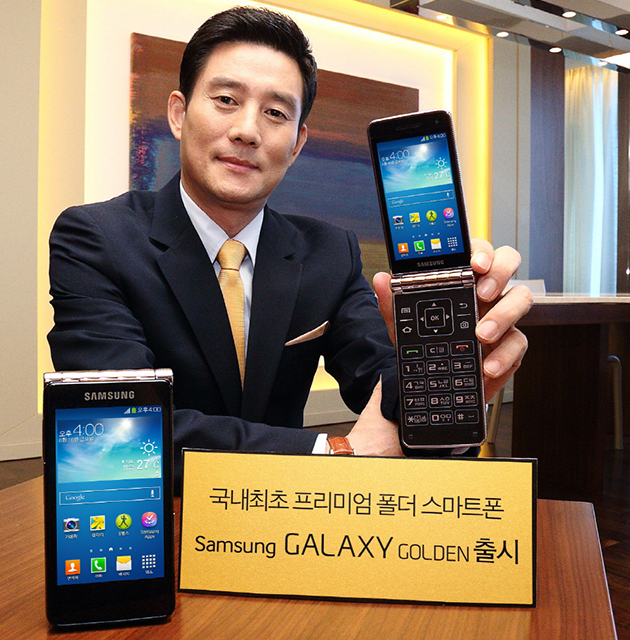 When the world seems to have left the flip phone form factor way back, Samsung has taken a chance with the new Samsung Galaxy Golden with a double screen. In the days of old when flip form used to ruled the roost and you did see top Hollywood actors flip their screens to speak on a mobile, you would always want one in your hand. The Motorolas Moto RAZR is one of a kind which gained success as a flip phone. And if you remember, Samsung already has a smart phone called Hennessy in its line up. But who can argue with the world leader in smart phone market. So here it comes. The Galaxy Golden will have two 3.7-inch Super AMOLED displays with a resolution of 800 x 480, and will be powered by 1.6 GHz Dual-core processor. It will have a standard issue 8MP camera and will run on Android 4.2 Jelly Bean. The smart phone will also feature the TouchWiz interface, S Health with pedometer, business card recognition, easy mode and a FM radio.